Nevada Cement Company has been manufacturing and distributing bulk and sack cement in Northern Nevada and Northern California since 1964. Construction began in 1962 and the production of portland cement began in 1964. Original design capacity was 540 tons per day. In 1969 construction of a second kiln, raw mill, and two finish mills began and was completed in 1970. By 1976, a coal handling and firing system had been added to the plant. In 1986, a Fuller single stage preheater was added to the number two kiln. Today, Nevada Cement’s production capacity is 500,000 tons of clinker and 560,000 tons of cement annually. Our plant is equipped with a rock crushing facility, two raw grinding mills, two rotary kilns, three finish mills, seventy thousand tons of clinker storage, thirty-four thousand tons of cement storage, and an onsite laboratory. The two rotary kilns are the heart of the manufacturing process. Each is eleven feet in diameter and three hundred eighty-eight feet long. The rotary kilns are long cylinders rotating on a slightly inclined axis such that raw materials fed in the upper end travel slowly to the lower discharge end where fuels such as coal and coke are ignited to produce temperatures exceeding three thousand degrees Fahrenheit. The raw materials are a blend of limestone, silica bearing clays and iron that are ground into a homogeneous powder by the raw mills and then metered to the kilns from blending tanks. As gravity slowly conveys the raw feed downward through the heating zones of the kilns, it undergoes specific physical and chemical reactions producing an intermediate product called clinker. Clinker is composed primarily of tricalcium silicate and dicalcium silicate crystals; two components which when mixed with water form cementitious materials called calcium silicate hydrates (CSH). The clinker is then ground once more with a small amount of gypsum in the finish mills to produce the final cement product that serves as the “paste” that is used to bond the coarse and fine aggregates together to produce various concrete products. Our laboratory operates twenty-four hours a day to monitor and maintain production quality and consistency. Chemical analysis of the raw and cement materials are examined by an MDX-1000+ X-ray fluorescence spectrometer. A Pearl’X Fusion machine fuses the raw materials to ensure accurate spectrometer results. All of our physical and chemical tests conform to ASTM standards and procedures. 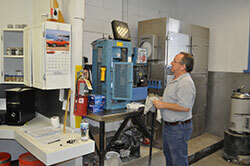 Our laboratory has been AASHTO accredited since 1996.